Factory sealed, from a private collector. Excellent condition. Cellophane still on. Includes price sticker. A few small marks on the disc. Excellent used copy, still in opend shrink with no issues. 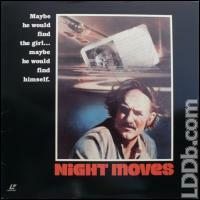 Arthur Penn detective favorite, with Gene Hackman and a nekkid Melanie Griffith in her screen debut. From a serious collector. Cover is very good, Disc is excellent. © 2002-2019 / Contact: Time elapsed: 0.012 sec.